A Fire Pit can be a nice addition to any outdoor living project. They offer an interesting focal point, and provide a natural location for guests to congregate and story tell. Fire pits really shine during those cool fall and winter nights. They can provide soothing warmth as we entertain our friends and family. Portable or permanent installation: If you’re looking for fire pit that you can move around or one that’s less expensive, portable is the way to go. Gas or wood burning: You can build or purchase a fire pit that is either gas or wood burning, so it boils down to personal preference and whether you have proper ventilation to burn wood. Material: The material you choose will affect the quality and design of your fire pit. Consider rust resistance, heat retention and design when choosing a fire pit. It’s important to strategically plan the location for your fire pit. First, your fire pit should be at least ten feet from your house, and allow for about a six foot diameter for guests to sit safely around the pit. 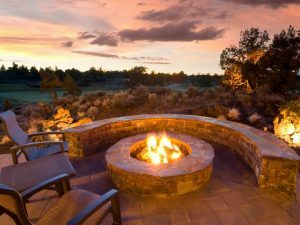 If your home has a view, you may also want to consider placing the fire pit where the view can be enjoyed. You’ll also want to take into consideration the fire pit’s orientation in respect to the wind. No one will be able to enjoy the inviting warmth of the heat if smoke and embers are blowing in their face, or if the wind is sending smoke towards an outdoor table. In addition to identifying the perfect location, be sure to place or build your fire pit on a neutral surface such as gravel, brick or stone. Placing a fire pit on a wood deck or lawn runs the risk of catching fire from drifting embers and sparks. Since fire pits are great for families and friends to gather around, be selective about your choice of wood or stone. Cherry wood not only smells amazing, but it does not spark like pine and other softer woods. In addition, don’t use pressed woods because they emit toxins. For gas fire pits, use lava rocks or fire glass. Never use stones or river rocks you’ve collected outdoors on your own because they can contain water which, when heated, will cause the rock to explode. When it comes to wood burning fire pits, light your fire the old fashioned way with a piece of newspaper and kindling. Don’t use flammable liquids because they can flair and send off harmful toxins. Just by taking a few extra precautions when you first get your fire pit, you can spend more time simply enjoying the comforting blaze. Most fire pits come equipped with screens to help minimize ash and sparks, but if yours did not, be sure to purchase one in order to protect anyone enjoying the fire. You will also need to properly maintain your fire pit as it gets more use. If you have a permanent fire pit, make sure that there is a secure drainage system to keep it dry. For both permanent and portable fire pits, purchase a cover to protect it from the elements and increase the longevity of your fire pit. Throughout its lifetime you’ll want to check for any loose hardware, regularly remove debris and ashes, and clean it regularly with a metal brush, soap and water. We are here to help! Give us a call (972.869.3333) or shoot us an email, we would love to show you how a new fire pit would make a great addition to your outdoor living.